The Great Pyramid of Khufu has always fascinated people because it is the only ancient wonder of the world that exists today. It is also possible people are fascinated because Khufu’s pyramid, especially the interior, is very complex. The modern entrance to the pyramid was created in the Ninth Century A.D. by el-Mamoun son of Haroun el-Rhasied. The true entrance is above this one. This passage goes down through the pyramid, and then connects to another corridor that ascends to the King’s and Queen’s Chambers. The original passage continues downwards into an unfinished chamber directly under the pyramid. Discussion about the purpose of these chambers and the complexity of the pyramid is varied and ongoing. Serious scientific work on the Great Pyramid began in 1993, when we closed the pyramid for the first time for a full year. It waspart of a plan to institute a rotational system at Giza, closing one pyramid a year while leaving the other two open, in order to balance conservation with tourism. During conservation it was found that the interior of the Great Pyramid had a humidity of 85 percent. Most of this was due to tourism, as each person inside the pyramid deposits approximately 20 grams of water through breathing. This water then becomes salt, which in 1993 covered the surface of the Grand Gallery; also, many cracks could be seen inside. In the south shaft, Dixon and his associate James Grant found a small bronze hook. The north shaft yielded a granite ball and a portion of cedar-like wood. They became known as the Dixon Relics. Both sets of artifacts lay amongst rubble at the bottom of the sloping shaft. The relics were taken to England, recorded by astronomer Royal Scotland, and returned to Dixon – after which they disappeared. Report of the discovery of the relics was made in “Nature” December 26, 1872, including a drawing of the items. In 1993 a search led to the discovery of the ball and hook in the British Museum, where they still are today. The piece of cedar-like wood remained missing until 2001, when it was traced at the Marischal Museum, Aberdeen. Although they are sure it is in their collection, they haven’t yet located it as they are in the process of moving. Gantenbrink’s exploration of the shaft in 1993 revealed a long piece of wood lying in the sloping portion of the shaft. Its cross-sectional area and general appearance were similar to the piece of wood found by Dixon. It is possible that the short piece of wood reported by Dixon simply broke from the larger piece. A modern metal pole found alongside the piece of wood supports this theory. No mention of the pole is made in Dixon’s reports, but it is now thought to have been lost when Dixon and his colleagues were “treasure-hunting” in the shaft. They probably broke the small piece of wood from the longer piece while they were manipulating the metal pole, but did not report it. Some suggest that carbon dating the wood would allow accurate dating of the Pyramid because wood must have been left in the shaft when the Pyramid was constructed (given that the shaft was sealed) but I contend that this is not absolute. Wood may been placed in the shaft after construction via the shaft’s exit, if one exists. Egyptologists have multiple explanations for these shafts. Some believe that they were used for ventilation, but this cannot be true as they do not open up to the outside. Others believe that they have an astronomical function; the southern shaft connected to the star Sirius, and the northern shaft linked to Minoris, Ursa, and Beta. Stadelmann believes that these shafts are not for ventilation, but are tunnels through which the king’s soul will rise to the stars that never darken. I believe that the shafts from the so-called Queen’s Chamber likely have no function, as they were blocked from the inside. If they had a religious function, they should have been left open, as were the shafts of the third burial chamber (the King’s Chamber). 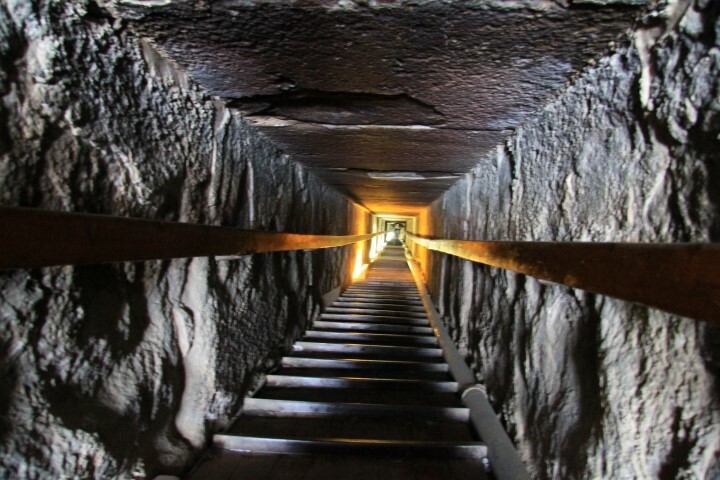 Since these open outside of the pyramid, I believe that Khufu’s soul was meant to travel through them. The south shaft was intended for Khufu to use as the sun god Ra. The south shaft opens exactly between the two boat pits to the south of the Pyramid. Khufu would take the two boats and use them as solar boats – one for the day trip, one for the evening trip. The north shaft was made for the soul of Khufu as Horus to travel to the stars in order to emerge from them as the sun god. In order to understand the purpose of the shafts of the so-called Queen’s Chamber, more work had to be done. The German Institute in Cairo had the concession to the Great Pyramid, and I could see that they were not interested in completing the work on the shafts. It was impossible to sign the concession to Gantenbrink as he is an individual, and the antiquities law in Egypt only allows for concessions to be granted to institutions. So I decided that the Supreme Council of Antiquities (SCA) would do the work. I asked Tim Kelly of National Geographic Television to design a robot to probe the shafts, and I would head the expedition. I believed there was nothing behind this door at all but that it was very important for scholars and the public alike to know that there is nothing behind it. Archaeologists would know that even empty space is important. National Geographic designed a robot and called it the Pyramid Rover, and the Permanent Committee of the SCA acknowledged the project as an Egyptian endeavor. The date for the television program was set for September 17. Before the show, I went to Hong Kong and Singapore to publicize it, and Mark Lehner went to Australia, India, and Spain right after the show. I, as well as my colleagues at National Geographic, wanted to be sure that we were honest and people were prepared for whatever find (or lack thereof) that we might make. One of the main goals of the documentary was to show the public the evidence of the people who built the pyramids. I was to talk about tombs, show graffiti which names the work gangs that built the pyramids, and even go inside of the Step Pyramid of Djoser for the first time. The substructure of this pyramid consists of tunnels and passages and rooms with a total length of about three and a half miles. I believe that the interior was never shown in a film before, and that no living Egyptologist has entered it. One day before the show, we found out by Altrosonic that the door in the southern shaft of the Great Pyramid is about six centimeters thick, which implied that there was something behind that door. We decided to drill a three-millimeter diameter hole in the door so we could send a camera behind it. In the last minute of the show, the camera was sent in, and I saw the second door 21 cm. behind the first door. It is not similar to the first in that it looks as if it is screening or covering something. There were also cracks all over the surface. I was so happy to see it, but I couldn’t understand why we had another door. The show was well received all over the world by the public, and was rated “great” by Fox Television in the United States. Half a billion people in China watched the show. Newspapers all over the world covered it to a level that was never done for any television program before. A few days after the show, we sent the robot into the northern shaft. Gantenbrink and Dixon both were only able to probe 27 feet because of a turn in the shaft. After further investigation, it seems that the turn was made in order to avoid intersecting the Grand Gallery, implying that the shafts were cut after the Grand Gallery’s construction. The Pyramid Rover went through this shaft and was stopped after a total of 208 feet, in front of another door with copper handles. It is in the exact same location as the first door in the southern shaft and is very similar to it. Behind this door there is likely another door exactly .70 feet away from the first, exactly like the south shaft. The copper handles in the first doors in both the north and south shafts are similar to those on the canopic jar box of Tutankhamun at the Cairo Museum. The two copper handles were used for ropes to pull the canopic jars. The doors themselves are made of fine white limestone from Tura, and it seems as if their handles allowed them to be pulled inside the shafts, to the same location. The probe attached to the robot gets ready to send its camera through a hole carefully drilled in the southern shaft “door”. The presence of these doors in the Great Pyramid creates many questions. One idea is that the doors are a challenge that the king must face before his travel into the afterlife. It is written in the Pyramid texts that the king will face bolts before he travels; perhaps this is a reference to the door’s copper handles. Yet if this is true, why is Khufu’s pyramid the only one with the doors? Also, why do they not exist in the shafts of the third chamber? Logically, they should be where the king’s body is buried. It is possible that these doors are evidence that Khufu’s burial chamber might be hidden somewhere inside of his pyramid. However, these doors made the story about the Great Pyramid of Khufu more exciting, especially because the second door in the south shaft does not look like the first one and also the door in the north shaft is located in the same place as the one in the south shaft and appears similar to it with its two copper handles. After the robot sent its probe through the handled slab in the southern shaft, another, more roughly hewn limestone slab, containing visible cracks was found. We are planning to clean the south shaft from outside to learn if it does open to the outside. If it does, then it is possible that it was a symbolic door for the king to use in crossing to the Netherworld. If it is sealed, we have to return to the Westcar Papyri and read how Khufu was looking for the documents of the god Thoth to help him with the design of his pyramid. Only further research into the shafts can reveal their function, solving one of the many mysteries of the Great Pyramid.